www.MichaelWalsh.org | DocBook to PDF? This entry was posted in Development, Progress, XML and tagged DocBook, documentation, PDF. Bookmark the permalink. 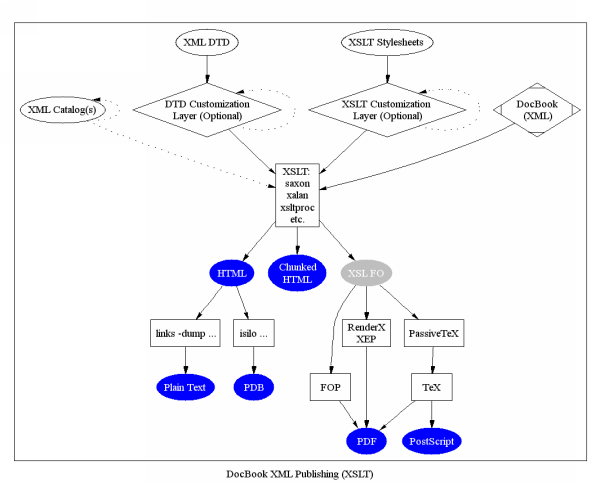 The DocBook is well published as you know, and being that’s XML there are many resources/ways to convert XML to PDF (or HTML or anything really) using XSL Transforms. If all of that is too overwhelming and XMLMind does a good job at a reasonable price you may be more comfortable with that solution. Furthermore…. I think OpenOffice 3.0 can read and write DocBook (just have to load a DocBook Style) and it has good PDF output capbabilities. Its Open Source/Free as well. I run mostly Windows but use Linux as well. All of my early release WordPress testing (e.g. 3.0) is done on Linux. If you know of a good DocBook to PDF converter that runs under Linux, I am not adverse to going that router. When I generate the documentation for phpHtmlLib, I have to run it under Linux so I am already doing something similar. It turns out that under RedHat Linux, which is what I am running, there is a command called “xmlto” which takes a number of arguments, one of which is “pdf”. The result is a nice PDF file. I’ll continue to play with this but it looks like I have a solution.